New York is one of the most diverse cities on the planet. More than one-third of the population was born in another country, and more than half of the residents here are not white. It'd be hard to imagine a creed, lifestyle or race that isn't represented in New York in one form or another. But even so, the first half of 2017 has seen a rise in hateful comments toward communities across town. 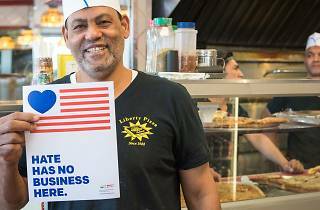 In an effort to fight back against divisive rhetoric, a growing collection of small businesses across New York have launched a campaign dubbed Hate Has No Business Here. 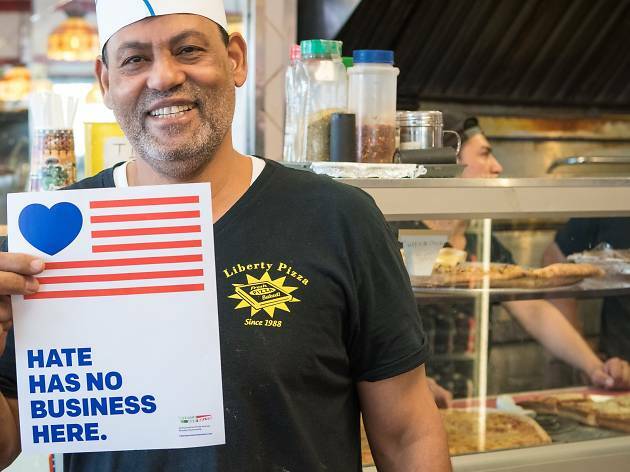 The idea is simple: businesses can download a free poster template, which includes translations of the title phrase in nine different languages, and post it on their storefront windows. The concept is the brainchild of Amanda Neville, the owner of Tipsy, a Brooklyn wine and spirits shop. The campaign was spearheaded by the Myrtle Avenue Brooklyn Partnership and now includes more than 20 business improvement districts across Manhattan, Brooklyn, Queens and the Bronx. Organizers are working to bring these posters to even more small businesses across New York and are hoping to expand their reach nationally. Hate Has No Business Here might not be able to curb the amount of xenophobic or racist commentary that circulates online, but, at the very least, it gives patrons assurance that their purchases are supporting inclusiveness.